So, I called my stylist Kelvin who is amazing by the way, to come over and help me pack and give me some tips as he was coming to LA with me. But as we were packing together I realised that it was one of those moments where you and your best mate just can’t stop chucking all your favourite outfits in. We appreciated EVERY item like, “yaaas that has to come with us” & “oooo but this is also really cute”. I looked like I was moving country haha! So, I wanted to find a flight that I’d be fully comfortable in as it’s around 11 hours to get to LA! 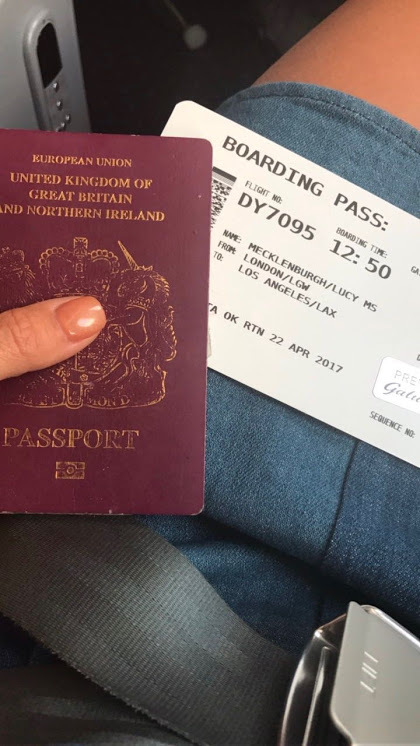 ✈ I was so lucky once I found a flight with Norwegian as they were genuinely one of the best airlines I’ve ever travelled with. The staff were super friendly and inviting. And the best bit was their MASSIVE seats and tons of legroom, which came in handy with sleeping on the flight  Check the insane amount of leg room. After checking the temperature in LA, I was in such a LA mood. I couldn’t help but wear my Ray Bans and Very Exclusives Jbrand dress. The dress is super comfy, cute and just an easy casj outfit. But I always travel with a tracksuit in my bag to change into, just in case. My shoes are from Schuh schools which are great to travel in. And my ultimate fav is the Paul & Joe bag. It’s just sooo pretty. All in all, my flight was on point and relaxing and I was happy with my outfit. The only thing is, is that I probably should’ve taken my own advice from my Holiday Packing Guide for this trip – I definitely over-packed this time haha!